Shown here is the step-by-step tutorial for my “Mermaid” Cuff design. The photo at the left side of the tutorial is 4″ x 6″, which will give you an idea of the size of the instruction photos. All tutorial instructions are accompanied by large full-color photos showing every step in the creation of the piece. Tutorials included in kits are provided in hardcopy format. Tutorials purchased without kits are offered in digital format…please contact me at the email address located at the bottom of this page if you would like to purchase a digital tutorial(s). *Please visit my Etsy shop for kits, tutorials, and design components. You can also read feedback I’ve received from customers there! New Geometric Earrings Designs are now available in my Etsy shop! Links to my latest Beading Kits are listed below. Tutorials are also available. Have you been eager to bead a project composed of Warped Squares, but didn’t know where to start? Then you might be interested in my Geometric “Staggered Warped Square Bracelet” design…it’s composed of six staggered warped squares (inspired by the books Geometric Beadwork and Contemporary Geometric Beadwork) worked in mosaic and confetti-like patterns that are joined together and connected with a sliding clasp. You can stop there if you like, but I’ve also added triangles to this design to make the project all the more interesting! Large full-color photos as well as seven color charts for beading the warped square and triangles accompany the step-by-step tutorial. The beading kit contains Delica and seed beads in fifteen vibrant colors plus a silver-plated 31mm long sliding clasp. You’ll find kits and tutorials in my Etsy shop. I think you’ll have a lot of fun making this “eye-catching” bracelet! *Please note: I do not include needles or thread in my kits as most beaders have personal preferences regarding these materials. My original cuff design “Fleurs et Papillons” (that’s French for Flowers and Butterflies) is unique in that the beaded design incorporates Polymer Clay flowers and butterflies although you can certainly substitute fabric for the polymer clay…I can envision this cuff made with etherial layers of moire, organza and tulle stitched to the beading foundation with sparkling flat-backed Lochrose crystals! There are so many possibilities! I used Metallic Iris Brown seed beads but, it could be embellished with all manner of novelty beads and crystals! And instead of using a brass cuff blank as the armature, the cuff ends could be joined by ties of flowing satin ribbon…a Fairie Queene-worthy creation, indeed! Does that whet your artistic appetite? The step-by-step tutorial shows you everything you need to know to create the cuff as well as bonus instructions for creating a collar. You will learn how to create flowers and butterflies using templates. Full color photos accompany every step along the way! It’s springtime all year long with this cuff! You’ll find this kit and tutorial in my Etsy shop. * Easy to follow Step-by-Step tutorial accompanied by large full-color process photos and templates for creating the flower and butterfly shapes. Brooches are versatile adornments that can transform any wearable be it shawl, blazer lapel, hat or sweater from ordinary to haute fashion! A beautiful multi-colored one-of-a-kind handmade Faux Fire Opal resin cabochon is included with this kit as well as flower-shaped beading foundation and leather backing. The finished brooch measures approximately 3″ in diameter. The variety of color-coordinated pearls, Swarovski flat-backed crystals, Delica, seed, and vintage Czech Charlotte beads is will help you create an Objet d’art! All are tucked into a handy 5″x3.5″ travel tin that you can toss in your bag for a portable beading project! The included step-by-step tutorial will give you all the information needed to create your own bead-embroidered masterpiece! Here’s a link to this brooch in my Etsy shop! * An easy to follow bead embroidery tutorial accompanied by sep-by-step large color photo. Each kit is unique and priced according to the size cabochon and amount of beads included. The beautiful jewel-like resin focal cabochons I create differ in size from 20mm to 25mm round and some are symmetrical in shape, which will ultimately determine your finished bead embroidered design. In each kit one resin cabochon is included along with color-coordinated embellishment beads…an assortment of pearls, crystals, Delica, Magatama, dagger, and seed beads, and others. A bead embroidery tutorial, beading foundation, leather backing, a pin back and E6000 is also included. All are tucked into a handy 5″x3.5″ travel tin! *Please note: I do not include needles or thread in my kits as most beaders have personal preferences regarding these materials. To see a current selection of kits available, please visit my Etsy shop! I love my “Tibetan Inspired Beaded Rope Necklace”! This mixed-media project features beading, polymer clay, and metalwork…a bit of something for everyone! nspired by the colorful adornment and jewelry of Tibet, this single strand rope is long enough to wear doubled (as shown) for a full, lush look. Hone your skills in Ndebele Weave (Tubular Herringbone) while stitching a stunning rope necklace accented with geometric beaded charms worked in Peyote stitch. Learn how to create beautiful faux amber, coral, and turquoise beads from polymer clay and finish your rope with a textured sterling silver heart-shaped charm to wear as a talisman for luck and love! Colorful and versatile, this rope is such fun to make that you may want to make a wardrobe of these in other colors! The kit contains twenty colors of Delica, seed, and Magatama beads as well as twelve of my one-of-a-kind handmade faux amber, coral, and turquoise accent beads (four of each) plus a handmade sterling silver textured heart talisman (to bring luck and love to the wearer!). The step-by-step tutorial included with the kit shows how to create the tubular Ndebele stitched rope and Peyote stitched geometric charms as well as the creation of the polymer clay gemstone beads and “how to” instruction for sawing, texturing, and finishing a sterling silver heart talisman. *Please note: I do not include needles or thread in my kits as most beaders have personal preferences regarding these materials. This listing is for the “Fire Dragon” Wrap beading kit. From head to tail and every Wing and Horn in between, this collar is quite the showpiece! Inspired by Contemporary Geometric Beadwork, it is my latest Dragon design and joins its predecessors, the “Sea Dragon”, “Sea Dragon Variation”, and “Loch Ness Sea Dragon” designs, also available in my Etsy shop. One-hundred-eleven flame-colored Horns dot the surface of the flaring Wings, which are composed of Delica beads in twelve vivid shades of red and a tiny dragon’s head made of epoxy resin clay covers one end of memory wire while the dragon’s tail is comprised of accent beads and an epoxy resin “tail” at the opposite end. The easy to follow step-by-step tutorial is accompanied by large color photos and a 4″ x 6″ color photo of the finished piece. Directions for creating the dragon’s head are included, but each kit contains a ready-made silicone dragon’s head mold to save you the trouble of sculpting your own dragon’s head! And, of course, you have the option of finishing the ends of the memory wire anyway you choose! Shown as a collar in the above photo, the kit is also offered as a Wrist Wrap…just be sure to check the Wrist Wrap Kit option when checking out if that’s the kit you prefer as it will contain a smaller diameter of memory wire and Delicas used in the Foundation and neckband will be substituted with 15/0 seed beads. The “Fire Dragon” Wrap is a stunning and dramatic piece! This project is recommended for the intermediate to advanced beader. A separate 4×6 inch color photo. *This kit also does not contain epoxy resin clay, as it has a limited shelf life. The clay is available at many craft shops, hardware stores, as well as on-line. Resources are listed in the pattern. Far away Polynesian islands, dense jungle, and waterfalls come to mind when I wear this cuff. I love flowers, especially exotic orchids and lilies! Offset by leaves in various shades of green, the colorful petals in this slip-on cuff make me think “Tropical”! I love this cuff…it fits like a dream! I’m enamored with the vivid colors as well as the substantial feel of the geometric architecture. Inspired by Kate McKinnon’s book, Contemporary Geometric Beadwork, the winged petals support tiny horned “seed pods” accented with Japanese Drop beads and Magatama bead “seeds” grace the outer edge of the elegant guide row on the band! 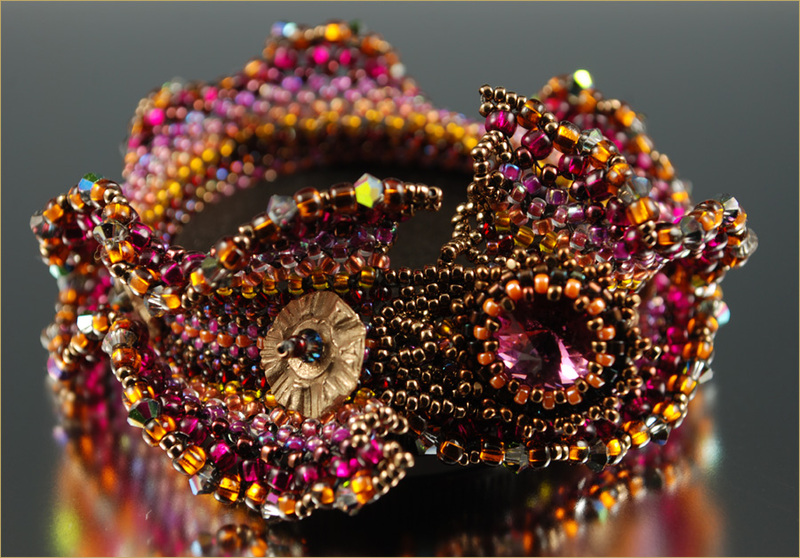 Comprised of almost 60 grams of beads using 26 colors of Delica beads, this beaded cuff is truly Art Jewelry! *An easy to follow, step-by-step tutorial accompanied by over 50 large color photos and colored charts. *Please note: I do not include needles and thread in my kits, as most beaders have a personal preference as to which brand and types of needles/thread they like to use. The “Mermaid Cuff”…my most ambitious project to date! Inspired by Contemporary Geometric Beadwork, and adorned with crystals, pearls, and glittering Delica Cut beads, this cuff is definitely mermaid worthy! Tiny metallic bronze horns accented with Charlottes and drop beads dance around the circumference, accenting the lime and lavender fish scale pattern that comprises this aquatic themed cuff. I loved creating this project! The “Mermaid Cuff” beading kit contains twenty-four colors and over 75 grams of Delica and seed beads, Charlottes, drop beads, crystals, and pearls in various shades of teal, mauve, lime, blue, and green with finishes in metallic luster, matte, opaque, iris, silver-lined, and crystal AB. The step-by-step tutorial for this exquiste and comfortable to wear slip-on Cuff has directions for small, medium, and large sizes. The seventeen page step-by-step instructions are accompanied by over fifty large color photos plus a pattern chart that will guide you through the color changes. This tutorial is recommended for the experienced intermediate and advanced beader. *A seventeen page easy to follow, step-by-step tutorial accompanied by large color photos and color charts. Do you remember the Flash Gordon Series and Planet Mongo? If so you will no doubt remember his nemesis, Ming the Merciless, who wore a flowing robe with an incredibly high pointed color. Although this geometric beaded cuff was not conceived with Ming in mind, upon completion it reminded me of his cloak. As far as I know there was no Empress Ming, but if there had been, surely she would have worn this cuff! If you haven’t guessed by now, the title of this design is the “Empress Ming Cuff”. It is study in geometrically beaded Wings and Horns inspired by the book, Contemporary Geometric Beadwork. The kit contains over 40 grams of Delica, seed, and drop beads and is available in colorways of Royal Blue and Brilliant Red – please specify your desired colorway when ordering. The easy to understand step-by-step tutorial is accompanied by full color photos. If you wish different colorways please contact me. This project is recommended for the intermediate to advanced beader. *An easy to follow clear and concise fourteen page step-by-step tutorial accompanied by full-color photos and color charts for both blue and red colorways. *Please note that I do not include needles and thread in my kits as most beaders have preferences regarding these materials. Have you ever seen Parrot Fish up close? If you have snorkeled or Scuba dived in Hawaii or other tropical waters and have had the good fortune to swim with them, you know they are incredibly colorful and that being enveloped in a school of darting, brilliant hued Parrot Fish is almost magical! This wide slip-on cuff encompasses all the beautiful colors and patterns of Parrot Fish I’ve had the pleasure to observe! This cuff is a challenging project that consists of ten different colored and patterned sections guaranteed to hold your interest! The “Parrot Fish Cuff” beading kit contains twenty-four colors and almost 60 grams of Delica and seed beads in various shades of teal, mauve, lime, coral, blue, and green, bordered by deep hematite and rich blue-greens with finishes in metallic luster, matte, opaque, iris, silver-lined, and crystal AB. The step-by-step tutorial for this comfortable and lightweight slip-on Cuff has directions for small, medium, and large sizes. Color photos accompany each step and colorful charts show color placement of each bead. An exciting project to make, the “Parrot Fish Cuff” is art to wear that is sure go garner comments and compliments! This project is recommended for the intermediate to advanced beader. *A seventeen page easy to follow, step-by-step tutorial accompanied by large color photos and colored charts. I love animal prints and the “Safari Cuff” is one of my new favorites! Designing Cheetah, Zebra, Giraffe, Tiger, and Crocodile patterns made this project all the more fun! You may have seen the progress of this geometric zigzag cuff from reading my WordPress blog posts. Well good news – the pattern and kit is now available! The “Safari Cuff” beading kit contains almost 50 grams of Delica beads in various shades of rust, brown, black, tan, ivory, and grey, bordered by deep red and rich bronze with finishes in metallic luster, matte, opaque, iris, silver-lined, and crystal AB. The step-by-step tutorial for this comfortable and lightweight slip-on Cuff has directions for small, medium, and large sizes. Color photos accompany each step and colorful charts show color placement of each bead. An exciting project to make, the “Safari Cuff” is art to wear that is sure go garner comments and compliments! You may sell items made from this tutorial but only on the condition that you credit me as the designer. This pattern is protected under copyright law and must not be reproduced, distributed, transmitted, published, or taught without my express written permission. When I only have a free hour or two, beaded components are my “go to” project. They work up quickly and offer immediate gratification, which is something I truly appreciate. Inspired by Wings in Contemporary Geometric Beadwork, I really love the mini-winged tube beads in this neck wrap, which by the way, can be made as a wrist wrap by substituting 2.25″ memory wire for the 3.75″ necklace memory wire. They play nicely against the stacked sequins, and small brass gear beads. Faux seashells made of epoxy resin clay finish the ends of the memory wire and miniature faux seashell bead caps add panache to the vintage Czech pressed glass accent beads. The tutorial contains easy to follow step-by-step instructions accompanied by full color photos. As a bonus I’ve also included directions for a tri-fold beaded bead, which is not used in this project. It’s just a little something extra for you to have fun with! The Wrap works up rapidly so it makes a perfect weekend project! The wrap is available in color shown, but you may request your favorite colors and I’ll put a kit together especially for you! Just check the Custom Color Request box in the shopping cart and include a note listing the colors you prefer. Of the three Sea Dragons I’ve made thus far (all inspired by the Sea Serpent in CGB), this one possesses the most texture with its seventy mini Horns jutting out from the ten Winged sections of the wrist wrap. The bracelet can also be worn as a choker doubling the fashion mileage of this sculptural wearable art! I’ve titled this Sea Dragon design “Loch Ness” for two reasons, the first being that the colors remind me of a Black Watch plaid, although this pattern work runs on the diagonal. The second is for Nessie, the famed monster that has supposedly been sighted on several occasions since 1934 when a couple spotted Nessie while driving by the lake, which might have a Sea Dragon as well…who knows? *easy to understand step-by-step instructions accompanied by large color photos and a chart. The bracelet is shown in sixteen glorious shades of blue, green. black, and gold! Of course, if you’d rather have different colors, I’ll be happy to put together a kit especially for you – just select “Custom Colors” when you place your order and include a note letting me know the colors you prefer or send me an email or convo telling me your favorite shades! You may have seen my “Sea Dragon Variation” wrist wrap (inspired by Contemporary Geometric Beadwork) in my WordPress blog posts. Well good news – the pattern and kit is now available! This Sea Dragon makes me think of all kinds of creatures that dwell in the sea – spiny seashells, crustaceans, and Lion fish to mention a few! This Variation of the original Sea Dragon wrist wrap is patterned in various shades of chocolate, praline, and mocha meant to resemble the skin or scales that might cover the body of such a creature. Tiny faux seashells made of epoxy resin clay cover the coils of memory wire at each end. Shown in Earth (orange/pinks/golds/browns), you can request Jungle (greens/bronze/teal), Ocean (blues/greens/purples), OR you may request your favorite colors and I’ll put together a custom kit especially for you! Be sure to include a note letting me know the colors you would like if you choose Custom Request. Imagine going for a swi m and coming across this life form floating toward you! By design, a cross between reptile and amphibian, my Sea Dragon wrist wrap is patterned in various shades of green meant to resemble the skin or scales that might cover the body of such a creature. Tiny faux seashells made of epoxy resin clay cover the coils of memory wire at each end. You may have seen my “Sea Dragon” wrist wrap (inspired by Contemporary Geometric Beadwork) in my WordPress blog posts. Well good news – the pattern and kit is now available in my Etsy shop! The kit is shown in the colors I used for the wrap I made, but you can request your favorite colors and I’ll put together a custom kit especially for you! Be sure to include a note letting me know the colors you would like if you choose Color Custom Request. *Please note: I do not include needles or thread in my kits as most beaders have personal preferences regarding these materials. This kit also does not contain epoxy resin clay, as it has a limited shelf life. The clay is available at many craft shops and on-line. This is the kit for my original design, the “Belles Fleurs” bracelet. This charming mixed media bracelet is inspired by the opulent jewelry of an era (1890–1910) when Art Nouveau was the rage. Beaded sections in checkerboard pattern worked in herringbone stitch attach to a length of supple anodized niobium chain maille. Petite flower bud charms of polymer clay nestle inside bronze metal clay caps and a beaded toggle and clasp closure embellished with tiny brass cogged disks finish this piece. You will learn how to create metal clay bead caps (although finished bead caps will be included in your kit), make polymer clay flower buds, work a very easy chain maille pattern, and stitch beaded sections in herringbone and ladder stitch following my clear, concise directions. This is a fun, easy and quick to make project suitable for all levels of beading skills. The kit is offered in seven lush colourways: The finished bracelet is shown in “Café Latte”, a lovely mix of metallic bronze, matte ivory and metallic steel iris Delica beads, purple/blue aurora borealis seed beads, metallic burgundy Charlotte beads and a blend of rich coffee, mocha, and platinum colored anodized niobium jump rings. Other colourways offered are: “April Showers” ( subtle blues/greens/lavender), “Tropic” (teal,coral, lime), “Tumeric” (spice/orange/lime), “Midnight” (deep blues/purples/burgundies), “Faded Denim” (pale blues, lavender), “Mardigras” (a mixture of bright blues/fuchsia/gold). Be sure to list your color preference upon checking out or email me if you would like to request a color combination that is different than those listed. Please see my Etsy shop to view the above colorways. This is the kit for the “Belles Fleurs Bracelet Version II, my original design. This latest variation is primarily bead woven and does not have the chain maille section that the first version has. Instead, the beadwoven section comprises the entire length of the bracelet and two petite flower buds now dangle at the toggle end of the bracelet. In addition, embellishment disks now frame both edges lengthwise. I designed this bracelet for those of you who do not wish to work in chain maille. The two versions of the bracelet complement each other so well and actually look wonderful worn together! If one were so inclined to extend the beaded portion, I think this design would look wonderful as a choker…I just may make one for myself! The kit is offered in several lush colourways: The finished bracelet is shown in “Spice” (a blend of bronze, saffron, and metallic black pepper, and persimmon). Other colourways offered are: “Ocean” (a blend of blues and sea green), “Midnight” (deep blues/purples/burgundies), “Forest” (a blend of greens, moss, bark), “Jewels” (a blend of ruby, topaz, amethyst, and peridot). Or email me with your favorite colors and I’ll custom blend shades for you! Be sure to list your color preference upon checking out or email me if you would like to request a color combination that is different than those listed. Take an imaginary trek through an Amazonian jungle and you’ll see the most interesting species of fauna and flora. The beaded portion of this bracelet reminds me of thick, heavy vines growing in abundance. And one look at these colorful polymer clay tropical buds nestling inside bronze metal clay blossoms and I’m almost there! If you’d like a project that works up really fast, this is the one for you. Although this kit comes with components that I have made for this kit (three bronze metal clay blossoms, Argentium 930 Silver wireworked jumprings and headpins, as well as a unique toggle/clasp), the directions show you how to make these items with step-by-step directions as well! The easy to follow step-by-step instructions are accompanied by large full color photos. The beaded portion is worked in Ndeble stitch with added beaded embellishment and is recommened for all levels of beading experience. I love this bracelet! The colorful little rectangular blocks and the petite patchwork embellishments that make up this design. Jewel-like Swarovski crystal Lochrosen rhinestones secure tiny textured polymer clay squares to various areas of the cuff. The materials combine to produce somewhat of a mosaic effect which makes me think of a magic carpet! I’ve even made a custom clasp of bronze metal clay to accompany the beaded toggle. This comfortable mixed media cuff measures 1 1/4″ in width and has lovely weight and drape. Available in my Etsy shop! Bollywood is the term popularly used for the Hindi-language film industry – a playful version of Hollywood done Indian style! Many of these films feature dancers attired in brightly colored clothing accented with beads of dazzling brilliance. Gold, saffron, garnet, hot pink, purple, and vivid blues and greens – these are the vibrant colors that I associate with Bollywood. I think this bracelet would fit perfectly with those costumes! I’ve aptly titled this piece the “Bollywood Bling” Beaded Ruffle Cuff. It sparkles with a beautiful Swarovski crystal rivoli and tiny crystals that line the cuff’s undulating seed beaded ruffled edges. More crystals sit atop handmade satin finished flower disks which I’ve made from bronze metal clay and sewn along the center length of the cuff. This piece just makes me happy! Imagine this piece in shades of turquoise or lapis lazuli or emerald. Yum…I want one in every color! The pattern directions show how to make the bronze metal clay flower disks, but I’m including finished flower disks in the kit for you. *Please note that I do not include thread or needles with my kits as most beaders have personal preferences regarding these materials. This isn’t a tropical vacation, but it may be the next best thing. Think of a walk along a beach, waves crashing over a rocky coastline, and flowing back out to sea leaving swirling tide pools behind, exposing barnacles and tiny seashells. With this free-form design, you’ll choose the colors and number of seed beads used for each barnacle, creating your very own one-of-a-kind piece of art jewelry! My pattern includes instructions for making bronze metal clay shells, but I’m also including the bronze button and bronze embellishment seashells with the kit so you’ll be ready to start stitching your cuff right away! I offer several colorways on my BigCartel page, but if you’d prefer a special color mix, feel free to email me with your request! *Please note that I do not include needles or thread in the kit as most beaders have preferences regarding these materials. Everything the above cuff has and more! Twenty bronze seashells and two buttons are included in this kit. The finished cuff measures about one and one-half inches in width. Luscious! I love this undulating spiral and the bold colors. This bracelet is sure to get noticed! And, because different techniques and mediums are used, it’s an exciting project to create and wear! You’ll stitch a spiral and accent it with textured custom colored polymer clay beads, a beaded toggle, and a metal clay clasp of your own creation. Of course, if you aren’t interested in working with metal clay, you can always make a clasp by stitching a beaded ring clasp – I’ll include extra beads for you! This kit is available in jewel tones, neutrals, earth tones, sunset brights, or pastels, or you may order it in your favorite colors – just email me with your request. *Note: Due to fluctuating silver prices and the expense of stocking silver, the metal clay is not included in this kit, but I will provide sources from whom it can be purchased. *Please note that I do not include needles or thread in my kits as most beaders have preferences regarding these materials. This bracelet incorporates a little bit of everything…four colorful polymer clay beads in several shapes, a right angle weave pod bead woven with Japanese seed beads, and a lovely flower bead, curved flower disks, and a flower shaped clasp made of fine silver metal clay. A leaf shaped clasp of polymer clay will attach to the bracelet with 18 gauge silver wire. These sculptural components combine to create a fanciful potpourri of delicious colors and textures. *Note: If you do not wish to work in metal clay, you may substitute the metal clay bead and disks with polymer clay – enough polymer clay is included in the kit to do this if you wish. * Note: Due to fluctuating silver prices and the expense of stocking silver, the metal clay is not included in this kit, but I will provide sources from whom it can be purchased. *Polymer clay (five colors) *note: Please request your choice of colors. *Please note I do not include needles or thread with my kits as most beaders have preferences regarding these materials. It’s wonderful to have a jewelry case with partitions of all different sizes specially designed to house earrings and bracelets and nifty little knobs from which to hang necklaces. But, if you have one or more special pieces, it might be nice to display them. Rather than being stored out of sight, I enjoy gazing upon my favorite pieces when they aren’t being worn. I made the sculptural earring stand for just this purpose! So, for those of you who would like to display a special pair of earrings, I’ve written directions and am offering the earring stand as a kit. It’s an easy, speedy, and fun project and you don’t have to be an artist to make one! The earrings featured on the stand are not included – a pattern for the earrings “Moroccan Surprise” is offered separately. Do you like earrings that are just a bit on the flamboyant side and sure to be conversation starters? Would you like a fun project that combines brick and peyote stitch and polymer clay? Do you like harmless snakes? Then this is the kit for you! Order in the color way shown or you may request water colors, jewel tones, or whatever colors your heart desires! This kit is recommended for the intermediate to advanced beader. Have you ever wanted to make Polymer clay beads but don’t quite know where to start? Look no further…this kit is for you! The design possibilities are endless. These directions will show you how to create a single design which you can alter in a myriad of ways to create a bevy of beautiful art beads! This project is suitable for all levels of expertise and may be ordered in neutrals, earth tones, water tones, jewel tones, brights, or pastels. *Please note that I do not include needles or thread with my kits as most beaders have personal preferences regarding those supplies. Swarovski rivolis are bezeled with Delicas and seed beads. The 12mm rivoli at the bottom of the necklace is accented with Charlotte beads and lies below the main focal “jewel”, a large Swarovski crystal. Peyote stitched round and oval rings link to segments of antiqued sterling silver chain . A sterling silver “S” hook clasp finishes this beauty! *Please note: Needles and thread are not included in my kits as most beaders have a personal preference as to which kinds of needles/thread they like to use. This kit may be ordered in the above color way, neutrals, earth tones, water colors, or jewel tones. This bracelet reminds me of colors andcreatures I glimpsed on the ocean floorwhen I used to scuba dive. Spiny dagger beads sit upon a base of right angled weave.The focal stone is a 27mm Swarovski crystal encased in a tubular peyote bezel of Japanese seed and Delica beads embellished with keishi pearls and tiny crystals. I’ve created an Opihi Shell button from polymer clay which fits into a branch fringe loop of tiny seed beads. Star Urchin buttons (shown below) made of polymer may be substituted if you like. Presently I’m offering this kit in neutrals, water colors, pastels, and jewel tone colors, but you may request your favorite color combinations and I’ll make up a kit especially for you! Recommended for the intermediate to advanced beader. Hone your brick stitch and wire working skills with these delightful earrings. At 2 1/4″ in length, they make a colorful statement and are such fun to wear! You may order the kit as shown or in your choice of colors. This kit is recommended for the advanced beginner and intermediate beader. *Delicas, charlottes, and a selection of pearls, crystals, and seed beads. Please note: Tutorials for the “Beaded Bronze Links” Bracelet and “Interlocking Rings” Bracelet have been combined to include both patterns. The “Beaded Bronze Links” bracelet has colorful beaded links, as well as handmade bronze metal clay rings that link with the beaded rings. It also has a nifty beaded toggle. This bracelet is worked in peyote stitch and is recommended for the advanced beginner to intermediate beader. Please request your color preference: earthtones, water colors, or jewel tones. * step-by-step instructions with full color step-by-step photos. Colorful beaded rings connect with each other in this project. The bracelet is finished with a handmade one-of-a-kind BRONZE metal clay toggle and clasp in a brushed or antiqued finish (the photo and pattern shows a silver clasp and toggle, but due to the escalating cost of silver, bronze will be substituted). Please request your color preference: earth tones, water colors, or jewel tones. This kit utilizes tubular and flat peyote stitch and is recommended for the advanced beginner to intermediate beader. Note: this kit is currently unavailable. * Easy to follow step-by-step instructions with full color step-by-step photos. *Please note: I do not include needles or thread in my kits, as most beaders have a personal preference as to which brand of thread they like to use. This graceful piece is the picture of understated elegance…from it’s center Aurora Borealis focal “jewel” to the tiny pearls and crystals edging the collar. A woven netting of shimmering Delicas and dark ruby AB seed beads are suspended from ladder stitched Miyuki gunmetal bugle beads. A handmade sterling silver “S” clasp at the back is the perfect finish. This project uses, ladder stitch, brick stitch, and woven netting and is recommended for intermediate to advanced beaders. Order in the above color way or you may request earth tones, water colors, or jewel tones. I can’t help but think of “Casablanca”, the classic Bogart and Bergman film, when I wear these Eiffel Tower earrings . This is a very quick and easy project that uses ladder and Ndebele stitch. The finished earrings measure 1 1/2″ in length. This kit is recommended for beginning beaders who have basic beading experience. This kit is available with Matte Metallic Bronze (shown), Gunmetal , or Metallic Bronze Iris bugle beads.